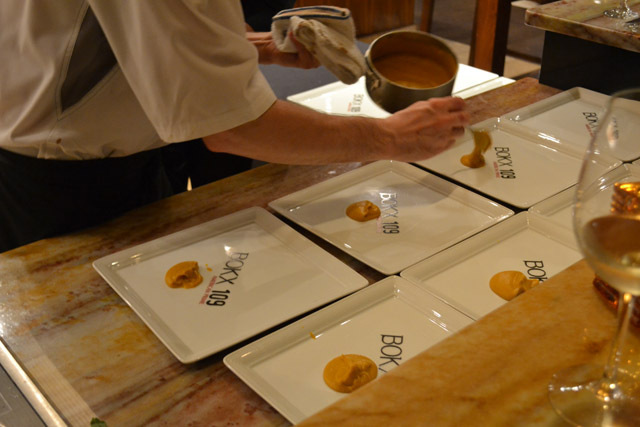 Last Wednesday night I was honored to be a part of a blogger’s tasting of the Fall Flavors Dinner at BOKX 109. I’ve had to been BOKX 109 at Hotel Indigo previously for events, and was always dying to go back to use the hotel’s pool when I was a resident of Newton. I enjoyed my visits then but I was interested to see what a new Excutive Chef Stephen Coe would have to offer. I brought one of the General Contractors that I work with to the dinner with me. I’ve been working on this project for 18 months now and he joined the team shortly after construction started last summer. I’ve brought in baked goods and other goodies to the team at meetings and have told him about the fun blogging things I do so I wanted to share this experience with him. 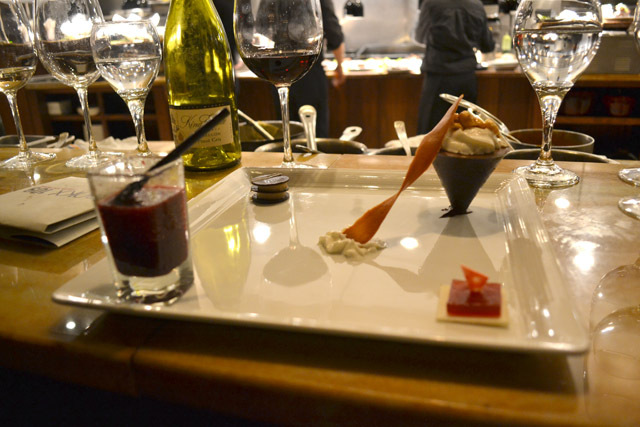 Obviously, Chris could not turn down a 12 course tasting menu with wine pairings. 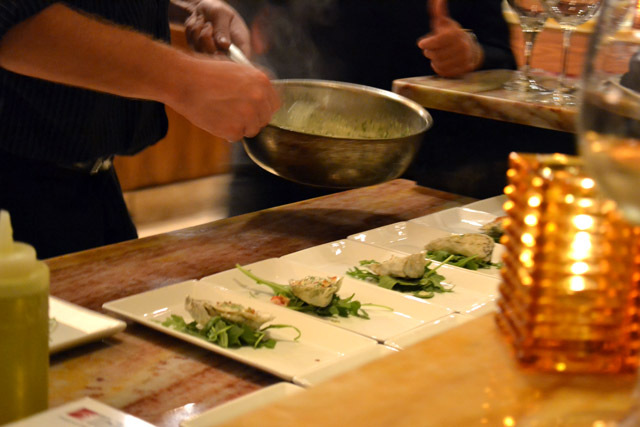 Pear & Mascarpone Sacchetti … aka ‘Smoke Show’ – sacchetti stuffed with pear and Mascarpone topped with a cream sauce, arugula, pickled red onion, and lemon. This is called ‘smoke show’ as the sacchetti, purse shaped stuff pasta, were plated and then served under a large wine glass that was filled with hickory smoke. The presentation was incredible. 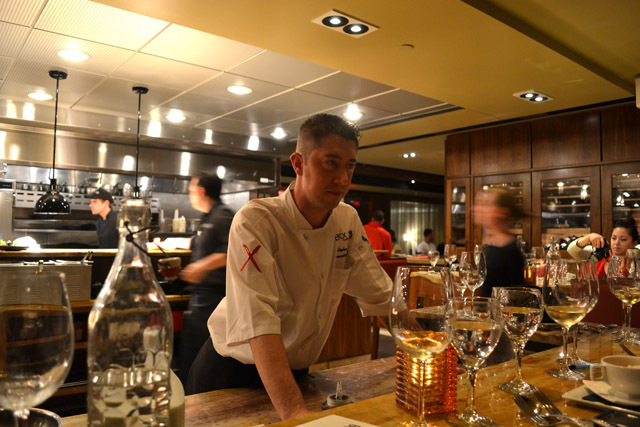 Chef Coe removed the wine glass for me so I could take photos of the smoke billow out. The smoke provided a nice subtle taste to the dish. 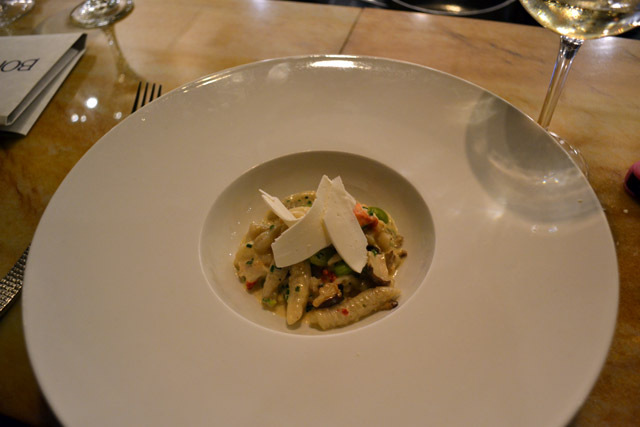 It added a nice contrast to the somewhat sweet tender handmade pasta delicately covered in a cream sauce. Once I took a bite of this dish I knew that the rest of the courses would be unforgettable. Knock your socks off first impressions. 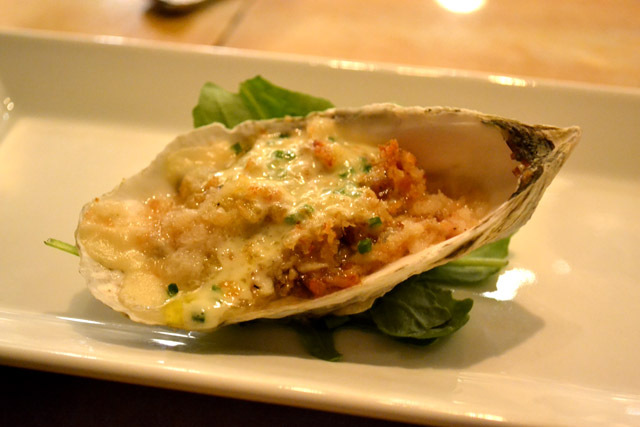 Grilled Oyster- local oyster grilled and topped with fennel pollen, tomatoes, panko bread crumbs, pancetta, and chive fondue. I skipped this course because I do not like oysters. It’s a texture thing. I gave my dish to Chris, who really enjoys oysters. He liked both but commented on how overall they were salty. Also he noticed that the second one (mine) was less briny than his, which he preferred more. 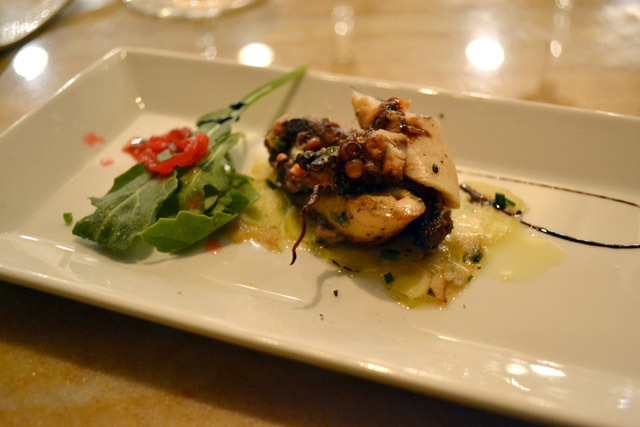 Grilled Octopus- Octopus Carpaccio and grilled tentacles served with Arugula and pickled red onions finished with lemon juice, olive oil, and chives. This dish has us stumped for a bit. We obviously knew there was grilled octopus put didn’t know what was below the grilled ocotopus. We were running through some of the ideas we had like hearts of palm or sunchoke. It was so thinny sliced and delicate! Well we asked Chef Coe and he explained it was octopus carpaccio, which is a dish of raw meat thinly sliced or pounded thin. Loved the play on 2 ways to prepare the octopus. Tomato Heirloom Soup- Campbell style, tomato, garlic, onions, basil. Finished with Parmesan foam. 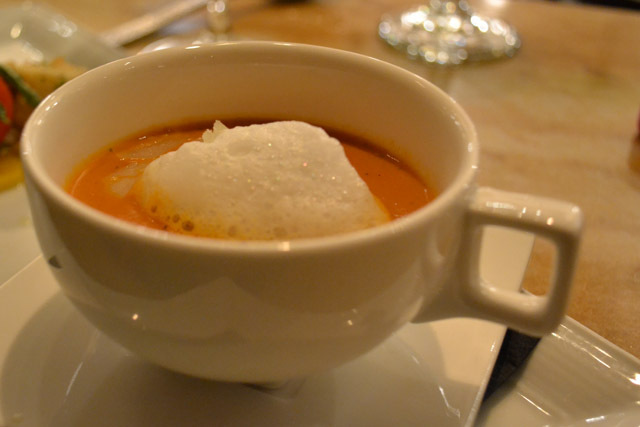 I could not believe that Chef Coe was describing his soup as ‘Campbell’s like’ as this was a hundred times better. I could see where he was going with this soup as everyone grows up with and reminds you of home, reminds you of warm coup after a cold afternoon playing outside. Bullseye. 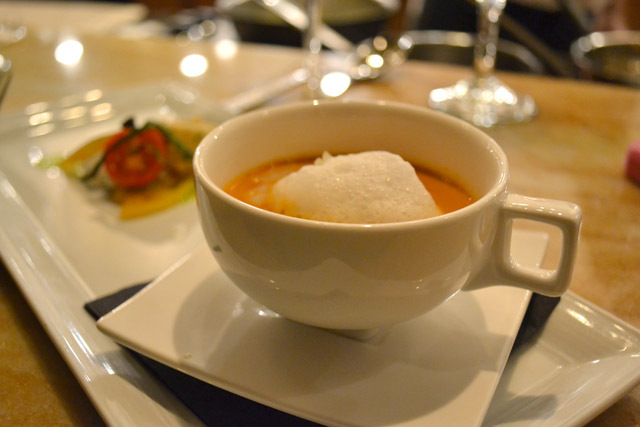 The soup was paired with a salad of fresh heirloom tomatoes and some fried cheese. While this was very good – basically a raw, whole soup – I still was wishing the soup was paired with a fun grilled cheese. I just can’t resist that pair. 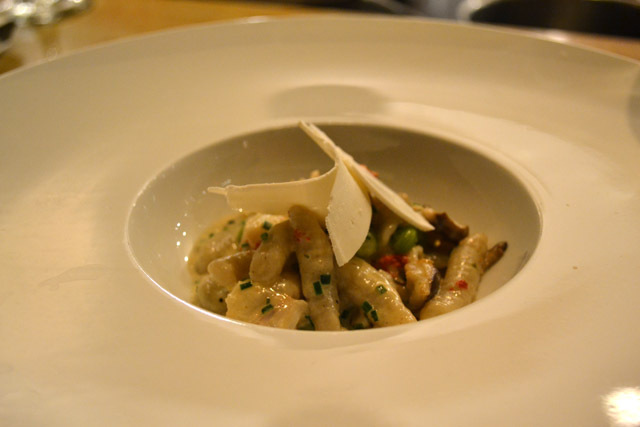 Lobster Cavatelli- Lobster meat, shitake mushrooms, edamame, and finished with a chive cream sauce. Such a big bowl, such a big tease. I’m honestly glad there was not too much of this as we were not even half way through dinner but if this was an entree I would need a massive bowl as this was one of my favorite dishes of the night. 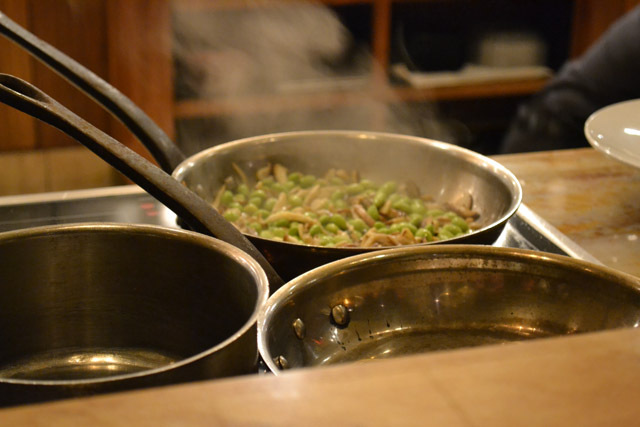 The fresh pasta was sauteed in the chive cream sauce and then combined with the mushrooms and edamame. 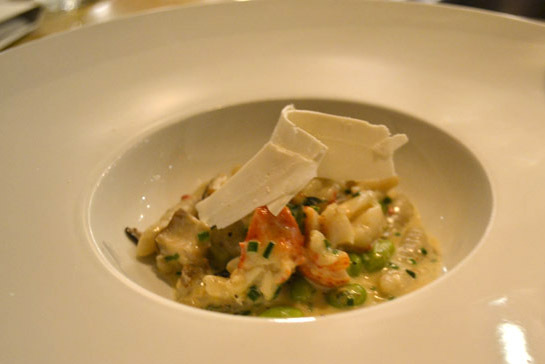 Lobster was tossed in and then it was all topped off with some ribbons of ricotta salata. Did you get all that? Wow. Like I said, I only wish there was some more of it. 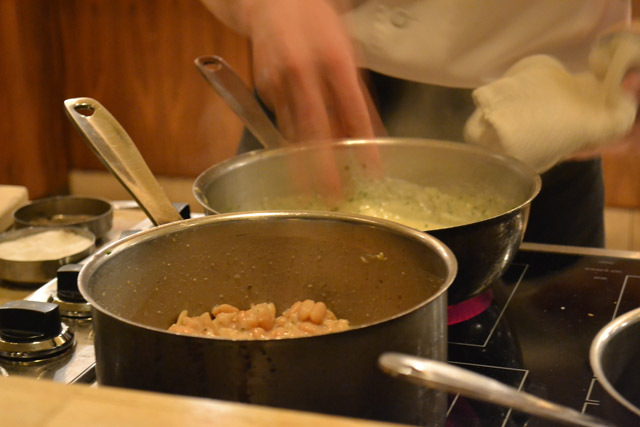 Did you know that ‘cavatellis are a type of pasta. The term cavatelli has two meanings: the most common meaning is small pasta shells that look like miniature hot dog buns. It is similar in shape to casarecci, but shorter in length. 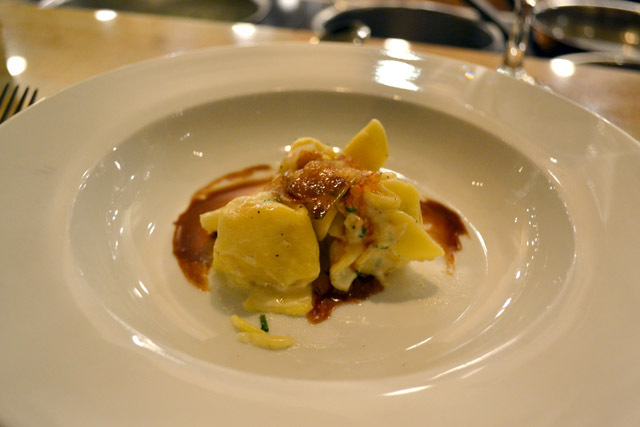 The name is less frequently used for a type of dumpling made with ricotta.’? I skipped this course. I just can’t eat rabbit. I think of my pets and I just can’t. Thankfully my partner in crime has no mental blocks and enjoyed this dish. He liked it so much he stole some more off my plate. 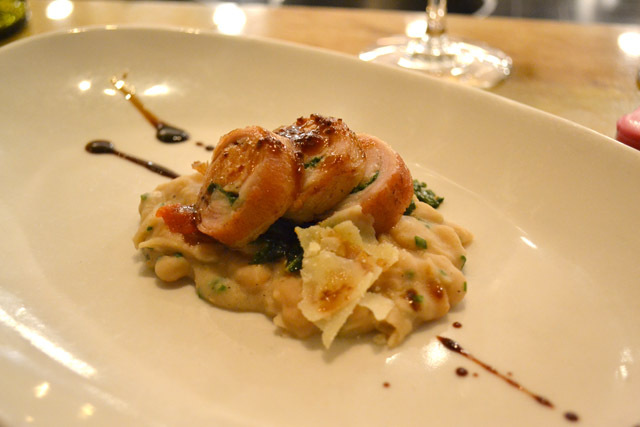 I should have just asked for the dish without the rabbit since the beans looked incredible. Dang it! Oh this course, I spent the rest of the week and all weekend thinking about it. 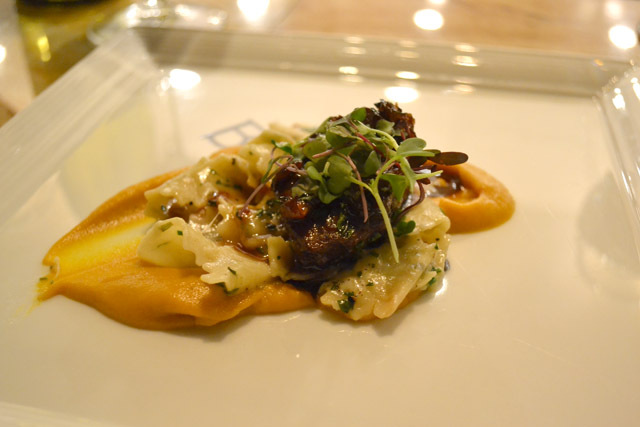 Fork tender meat on a bed of fresh pappardelle with parsnip puree. 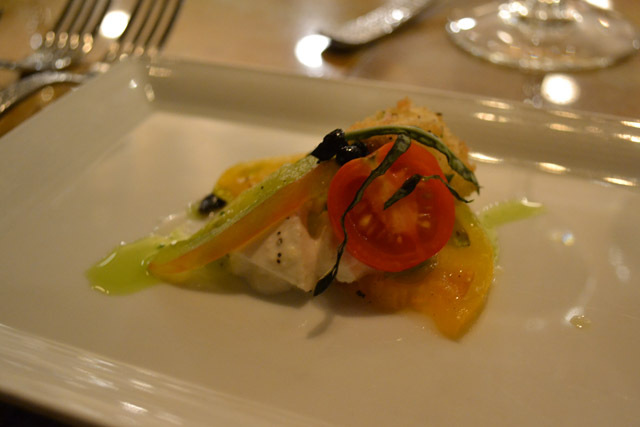 Every element of this dish was thoughtfully prepared. The veal was incredibly tender and seasoned perfectly. It was my first time having anything made in the sous vide technique and I am a firm supporter of it now. So tender! 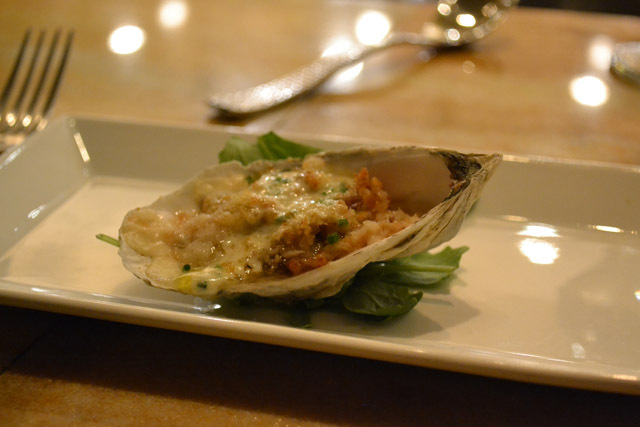 The fresh papparadelle was tender and lightly coated with a tarragon sauce. Now, I can’t believe I am saying this but I could have had a soup bowl full of the parsnip puree. I’m sure there is an obsence amount of butter/cream/magic in there but I don’t care as it was ah-mazing. The puree was fine and if you close your eyes you just imagine fall. I was talking to Chris was I was taking photos as he began to eat. I was shooshed. 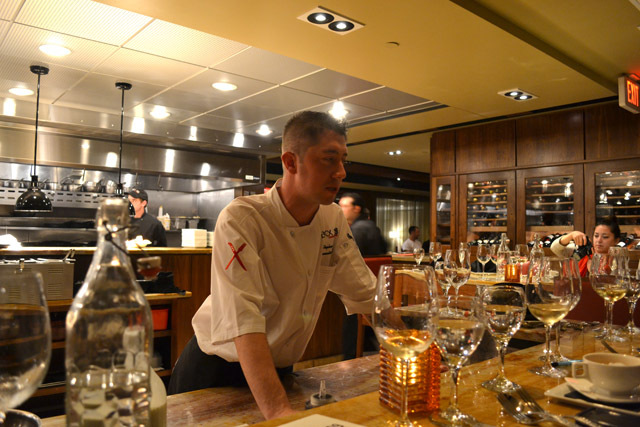 He was haivng a moment with the veal cheeks. I then had my moment a minute later. 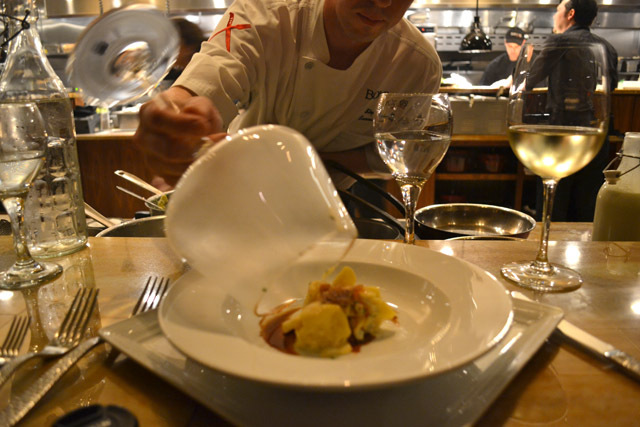 I love when a dish leaves you speechless. Bliss. Every element on the plate was unique and delightful. 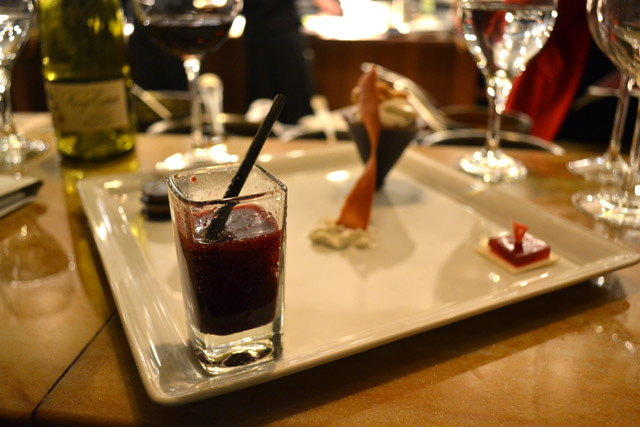 The blueberry and Persecco shooter was a fun. I loved the presentation of it in the square shooter and tiny straw. I only wish there was more Persecco as it was a little thick for the straw, but the flavors were light and refreshing. The jelly duo was a nice delicate dessert. The white balsamic was light in flavor and was a nice pairing with the strawberry jelly. I’ve had concentrated balsamic with strawberries in the past but the white balsamic is even better match. 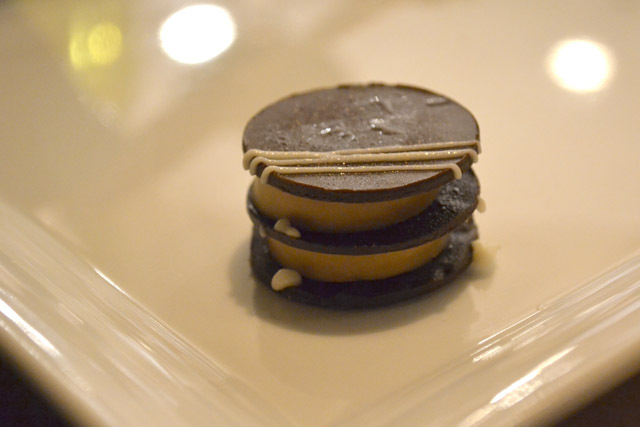 The petite tiramisu was exactly that- a tiny bite of tiramisu. Very clear flavors, but not too intense. The chocolate cyclone was so intense and rich. It was a chocolate cone filled with chocolate mousse and topped off with caramel corn. O.M.G. fun presentation and fun dessert. This was such a fun way to end the dinner. 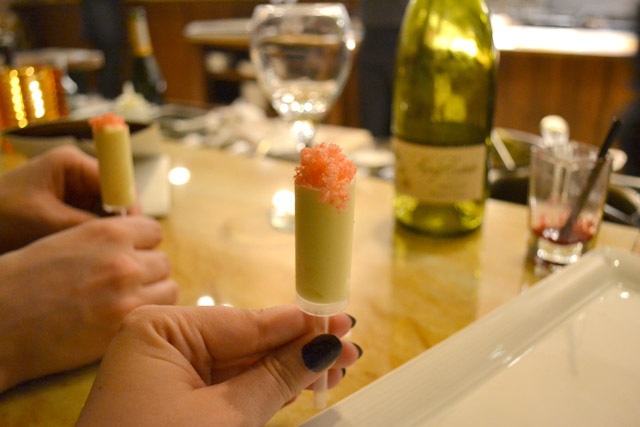 The poprocks added a fun, whimsical end to it while the lemon souffle was like last hurrah. The frozen lemon souffle, which was not too frozen, reminded me of lemoncello, which is an after dinner Italian drink. Fun! I enjoyed all of the wine pairings we had during dinner. 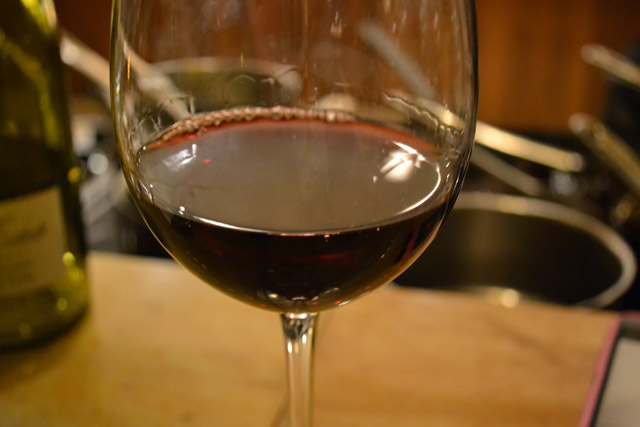 From light fruity wines to richer reds, this covered it all and were paired nicely. All were new wines to me. I would try them all again while shopping for some wines to pair with dinner. I loved this evening at BOKX 109. 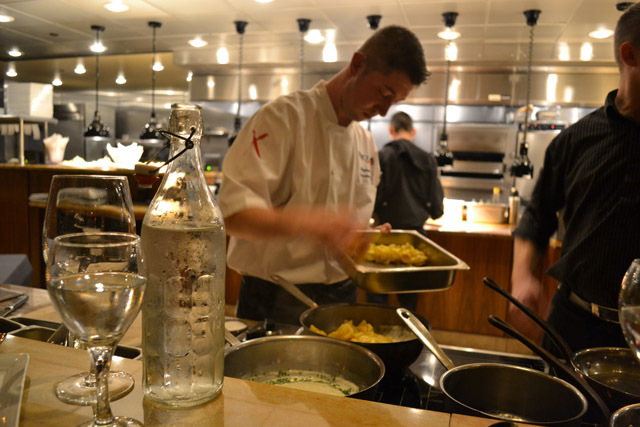 It was a very special dinner as it was at the chef’s table and a custom 12 course dinner for the group of bloggers. 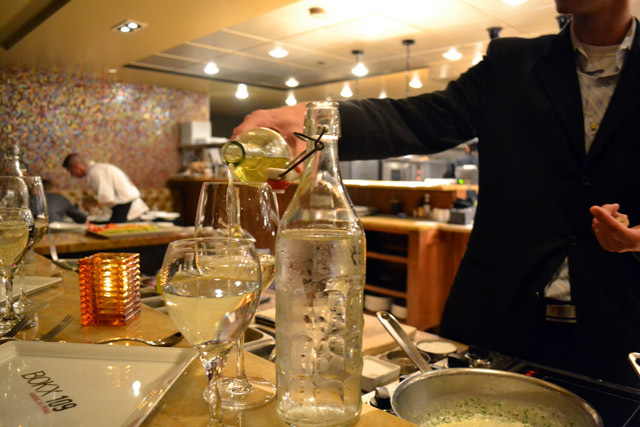 However, Chris and I watched the dishes coming out of the kitchen and we were dying over some of the things we saw coming out for the dinner service. There was a trio of beef that got higher as was arranged on the plate. Trio of beef!! Oh and don’t get me started on this dish with that started with a bed of potatoes, then asparagas, and then a cut of beef (fillet?). That was covered in hollandaise and then topped with lobster. I could die happy after that. *While I did receive this complimentary meal from BOKX 109 these opinions are entirely my own.